Leaving the coast Karijini National Park is the key objective as you hack your way through the heart of the Pilbara. It’s a great ride on seldom used roads through generally uninhabited territory. The Hamersley Range is the largest and most rugged in Western Australia and has 18 of the highest peaks, umm, humps, in WA. A spectacular backdrop for much of the ride. Don’t expect too much company along the way. Not really on the touring path for most cycle riders but well worth the effort. Karratha to Dales Gorge, Karijini National Park, Western Australia taking in some of Millstream Chichester National Park, Hamersley Gorge, Weano and Handcock Gorges, then Dales Gorge. From there it’s a choice of heading towards the coast via Tom Price and Nanaturra Roadhouse, or striking south to Newman on the Great Northern Highway. 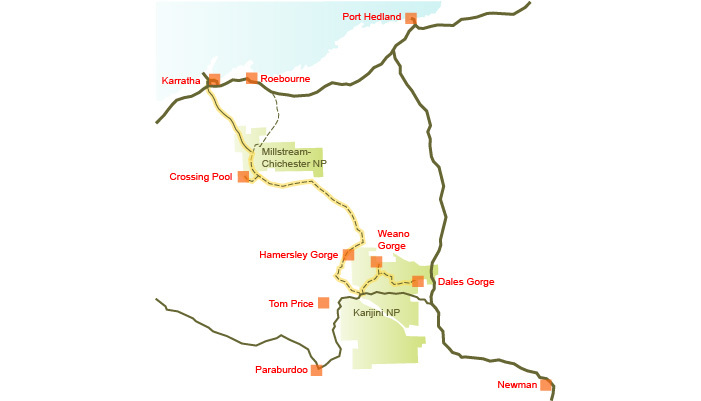 The Hema Pilbara and Coral Coast map also has detailed inset maps of Karijini and Millstream Chichester National Parks. Allow 8 days riding with an extra day off at Dales Gorge. April to October. It’s way too hot in summer. Suggested touring route to Karijini in orange. Permanent water points shown. Take the little used new road that branches off a few hundred metres west of the Karratha Roadhouse on the North West Coastal Highway. The first 90km is sealed and follows the iron ore railway line on it’s way to Tom Price. The seal ends just before the junction with the unsealed road from Roebourne. Overall the unsealed road surface is reasonable, there is little traffic but because of the route being the quickest way from Karratha to Tom Price it is kept in good condition by the mining companies. Maybe could go as far as saying the road surface is as good as it gets in the Outback. The road is undulating with views to the Hamersley Range which makes it rather scenic. There is a climb up the Rio Tinto Gorge, (don’t know where the river, red or otherwise, is), with a short more extreme section towards the top which is sealed and narrow enough for just the width of a large vehicle between the rock faces in places. The Karijini National Park roads tend to be more gravelly and have more tourist traffic. Plan carefully. Water is available at the Karratha Roadhouse and then Crossing Pool in Millstream Chichester National Park. Stock up there because Hamersley Gorge is the next water point. From there all the gorges in Karijini have flowing water but filtering is a sensible option here. The official drinking water tank near the western park entrance was empty and didn’t appear that the windmill would be fixed any time soon. The one near the information centre was full. Coles and Woolworths supermarkets with nation wide pricing in Karratha, takeaways and a few expensive groceries at the Karratha roadhouse. Yup, that’s it. No other stores or roadhouses until you make it into Tom Price, or Newman, which both have big supermarkets. You gotta lug more than a week’s worth of muesli and spaghetti with you. A choice of way too expensive caravan parks in Karratha, if there’s room. Accommodation in this town is a premium due to the existing WA mining boom and the $50 billion Gorgon gas field development currently under construction. Karratha is right in the heart of all the mining action. You can camp out behind the Karratha Roadhouse for nothing to avoid carrying another night’s water. A much better deal but you get what you pay for here (ie, grotty). The national parks only allow camping in the officially sanctioned sites. Millstream Chichester National Park has a few but the one at Murlamunyjunha (Crossing Pool) might be preferable due to caravans, (and therefore their inhabitants), not being permitted, $7pp. It’s good to camp on the bank of the permanent waterhole and jump in the pool to wash off the dust. The water is tepid and there’s no crocs. There’s two official campsites at Karijini with showers etc for $7pp if you require a shower after your day swimming in the gorges, but some naughty bikers have been known to avoid these and camp in the Hamersley and Weano Gorge carparks with all the Wicked vans. Both carparks have pit toilets but not much else. Out of the parks it’s bush camping but with the limited amount of traffic you are unlikely to be disturbed. Millstream Chichester National Park also has Python Pool as a 19km each way excursion back towards Roebourne but it’s at the bottom of the escarpment, requiring another climb while retracing your route, and adds almost another day to the trip, requiring carrying extra food. The pools in Karijini are maybe more worth any extra time. Karijini National Park is as scenic as the advertising would suggest. Peak experience would have to be wandering down the narrow Hancock Gorge, through the Spider Walk to swim at Kermit’s Pool. Hamersley Gorge for seeing rock tied in knots by huge primordial forces and also a great swimming pool. Weano Gorge, down to Handrail Pool for another dip. The Oxer Lookout overlooks the meeting place of three 100m deep narrow gorges. Prepare to be startled. The Dale Gorge end of the park is more populated and while spectacular with Circular Pool and the walk up to Fern Pool maybe by that time you are almost gorged out by all the gorgeous gorges. Just the food and water issues. It’s a long, long way from supplies out there. Karratha to Newman is about 12 days if you take a few days off along the way. You can get a few 40ºC+ days, (104ºF+), at almost any time of the year, or frosts on winter mornings. Heading towards the Hamersley Ranges most cars will stop for a chat after they get over the WTF are you doing out here part. These 27 images give a general impression of the road conditions you are likely to encounter out there. And just a few pretty pictures too.